"If these walls could talk" has become a cliche in the historic preservation world, but when standing inside an old synagogue its still a irresistibly phrase and ideas. Anita Kassof, associate director of the Jewish Museum of Maryland and illustrator Jonathon Scott Fuqua, have taken the idea and made an appealing children's book from it. “Long before your grandparents’ grandparents were babies, before they walked or talked or tied their own shoes, I was built with shovel and pail, hammer and nail, brick and stone.” So begins the narrative of Baltimore's Lloyd Street Synagogue, opened in 1845 as Maryland's first synagogue, the Baltimore Hebrew Congregation, as told in the recently published The Synagogue Speaks [ISBN: 978-1-883312-12-1]. I wrote about the restoration of the synagogue back in 2009. The historic building, now part of the museum, evolved from traditional to Reform observance in the mid-19th century, and then was transformed into a Catholic church in 1889. In an less common twist of fate, the building became home to an Eastern European Orthodox Jewish congregation in 1905. It was saved from the wrecking ball in 1960 and now serves as the cornerstone of the Jewish Museum of Maryland, and has long been celebrated as one of the first Jewish community historic preservation successes. That's a lot of history to relate in a 48-page book, especially on with only about 100 words per double page. 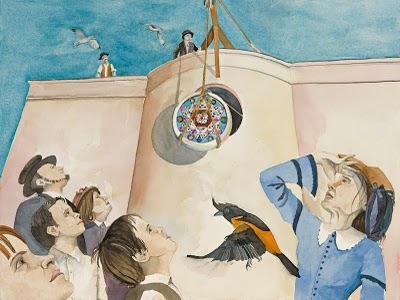 But the richly detailed and historically precise watercolors by Fuqua bring the story to life. While the book is recommended for children ages 4 to 10, I think adults will enjoy the illustrations - some of the construction views are in the style of the great architectural illustrator David Macaulay. The book is available at the Jewish Museum of Maryland’s shop, on its website or through book stores. You can read about the making of the book here. For those whose appetite is whetted for more history of the building and its history effort, there are several good articles form the 1990s by former director Bernard Fishman, and the catalog from the exhibition on Maryland synagogues held at the museum a few years ago. Baltimore, Maryland. 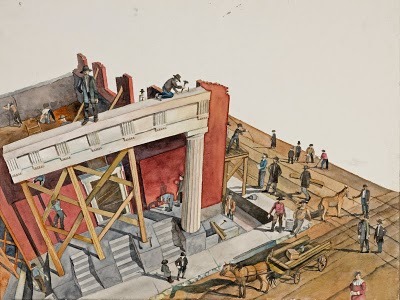 Two Lloyd street Synagogue construction scenes illustrated by the Jonathon Scott Fuqua in The Synagogue Speaks. (The Jewish Museum of Maryland, 2011). 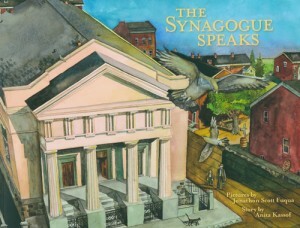 Children's books that tell the stories of American historic sites are quite common, but The Synagogue Speaks is only the second example of the genre that I know of that tells the story of an old American synagogue. The Old Synagogue written and illustrated by Richard Rosenblum (1989) tells the story of the creation, decline and restoration of a small New York synagogue (like the Stanton Street Shul) - it is a mix of reportage, nostalgia, exploration and discovery. More recent is Mark Podwal's Built by Angels: The Story of the Old-New Synagogue. This children's book, also 48 pages, is more about myth, mystery and imagination. Its vivid illustrations and text of legends leans more to the fantasy genre than to history. While it does introduce young readers to a important building and history, it also reinforces misconceptions and stereotypes - not the best way to learn from the past, but perhaps a way to inspire curiosity. Other congregations and historic preservation planners will want to learn from all these examples. Cahn, Louis F., 1973. The Restoration of the Lloyd Street Synagogue. Jewish Historical Society of Maryland, Balitmore, Maryland. Fein, Isacc M. The Making of an American Jewish Community: The History of Baltimore Jewry from 1773 to 1920. (Philadelphia: JPS, 1971). Fishman, Bernard, 1989. "Lloyd Street Synagogue's Wandering Ark: Solving Architectural Mysteries in Maryland's Oldest Synagogue," Generations (Fall), 17-21. Fishman, Bernard, 1995. "Color and Camouflage in Baltimore's Lloyd Street Synagogue, 1845-1991," in Maryland Historical Magazine, 90:3 (Fall 1995), 287-311. Goldman, Israel M., 1978. "The Second Oldest Existing Synagogue Building in Baltimore ---The Chizuk Amuno Synagogue on Lloyd and Lombard Street," Generations, 1 (Dec. '78), 33-44. Pruce, Earl, 1993. Synagogues, Temples, and Congregations of Maryland: 1830-1990. Jewish Historical Society of Maryland, Baltimore. Tabak, Israel, 1972. "The Lloyd Street Synagogue of Baltimore: A National Shrine," in ­American Jewish Historical Quarterly­, 61, 342 352. Zalesch, Saul E., 1984. Synagogue Building in Baltimore During the Nineteenth Century, M.A. thesis, Department of Art History, University of Delaware. Riga, Latvia. Old Jewish Cemetery. This how the site looked when I visited with Commission members Lee Seeman and Gary Lavine in 2003. Photo: Samuel D. Gruber (2003). (ISJM) On June 30, 201 the Jewish Communities of Latvia organized a series of events commemorating the 450th anniversary of the Jewish community in Latvia and to the 70th anniversary of the beginning of the Holocaust. 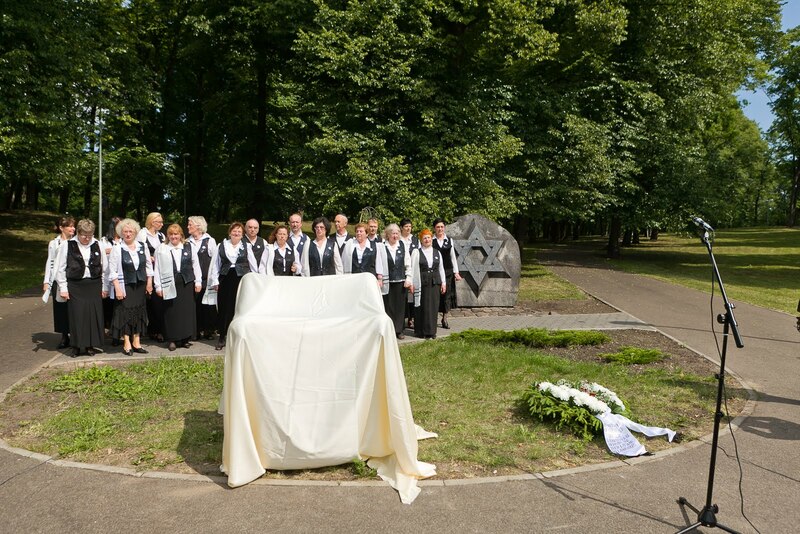 As part of those events, a new explanatory plaque sponsored by the United States Commission for the Preservation of America's Heritage Abroad was installed at Riga's Old Jewish Cemetery. Commission member Lee Seeman organized the project and raised the funds. I am especially pleased to see Lee's continuing commitment to this project and so many others in the region. 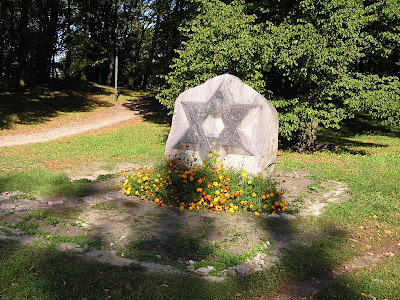 We visited the site together in 2003 with Meijers Melers, the preeminent expert on Latvian Jewish sites, and saw the relatively new large boulder on site, with a prominent Jewish Star, but there was no text or other information telling what the site was and what had happened to it. Without an informed guide, we would have been entirely in the dark. Lee Seeman persevered and saw to it that future visitors would not be so perplexed. In all its projects the U.S. Commission has never felt it enough to charge people to "Never Forget." The Commission insists in all its projects that accurate information is provided to the visitor or viewer to better teach them what to remember. 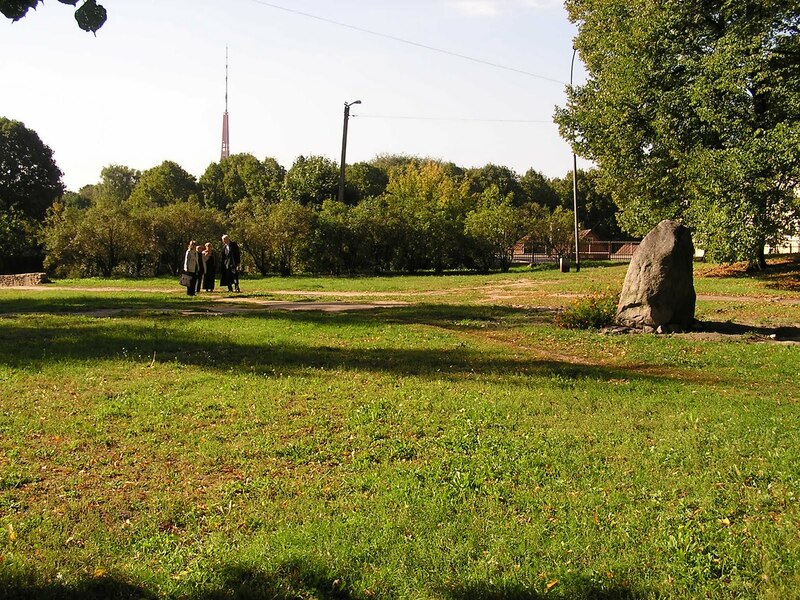 Its previous work in Riga, on the Rumbula massacre and mass grave site monument is a good example. Riga, Latvia. Old Jewish Cemetery. Impressive memorial stone placed on site in 1990s, but with explanatory text. Photo: Samuel D. Gruber (2003). The current exhibit of photographs of the sculptural work of Chaim Gross (1904-1991), “Displayed: Stages for Sculpture,” is on view until December 16 at the Renee and Chaim Gross Foundation in New York. Gross practiced what he (and contemporaries) called “direct carving” and created totemic human figures out of wood and stone. According to the exhibit organizers he "was a perfect subject for photographers who wanted to capture his creative process." Sculpture, as one of the most active, physical and, of-course, 3-dimensional forms of art, and one that could be represented well in black and white with light and shadow, appealed to photographers and was frequently featured in the many photo and news magazines of the early 20th-century. 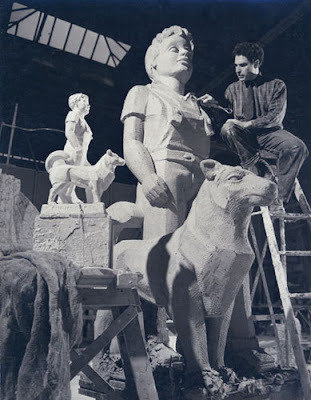 "The photographs chart the “stages” in the making of sculpture, and public “stages” displaying Gross’s work, such as the 1939 World’s Fair, educational carving demonstrations, and commercial print media. The exhibition, curated by the Foundation's archivist Zak Vreeland, features images from the Foundation’s collection by renowned photographers Arnold Newman (1918-2006), Eliot Elisofon (1911-73), and Rudy Burckhardt (1914-99). It also includes works by less known, yet equally compelling photographers Robert M. Damora (1912-2009), Soichi Sunami (1885-1971), Walter Rosenblum (1919-2006), and Arnold Eagle (1909-92). Chaim Gross knew many of these photographers at the beginning of their careers and became particularly close with Arnold Newman and Eliot Elisofon. Gross hired them to record the process of sculpting, both in the privacy of the studio as well as various public venues. The photographers also featured Gross, his house, studio, and sculpture in news stories, fashion spreads, and advertisements in publications such as Life and Glamour. The exhibition explores this relationship between sculpture and photography. It also considers the convergence of two modes of production: Gross’s signature process of hand carving and the mechanical reproduction of the photograph. Of particular interest are photographs of window displays that featured Gross’s sculpture in arrangements with mannequins and merchandise from c. 1940-50 at Bonwit Teller, Saks Fifth Avenue and Lane Bryant. These include an eight-window display for Bonwit Teller designed by the preeminent window designer Gene Moore (1910-98)." View the 1957 film The Sculptor Speaks (17 minutes) on the Gross foundation website. Read more about the life and work of Chaim Gross at artnet.com. As it happens, the Syracuse University Special Collection Research Center has four boxes of Gross papers. I'm looking forward to finding time in the next year to examine these, or to interest a student in the project. Beyond the Facade: A Synagogue, a Restoration, a Legacy: the Museum at Eldridge Street by Roberta Brandes Gratz, Larry Bortniker and Bonnie Dimun (Museum at Eldridge Street and Scala Publishing, 2011), highlights the almost thirty-year effort to restore New York's Eldridge Street Synagogue. The new book contains an evocative and informative essay by Roberta Brandes Gratz, one of the initiators of the project and the energetic organizer and definer of the work in its early formative phases. As Gratz writes of this and any similar project "There was no time to be discouraged. Restoring a landmark that has been abandoned by those most connected to it historically is only for the young, the persistent, and the deeply committed, and surely not for the faint of heart." Ms. Gratz was never faint of heart, and she committed as large chunk of her life to saving the grand synagogue and to recovering and retelling the history of the building, its congregation and its role in the American immigrant saga. Gratz was helped by hundreds along the way, and followed in a leadership role by Amy Waterman who advanced the project in substantial ways - raising new awareness and especially large sums of money through various wards and grants. Innovative restoration methods were developed, especially the excavation and use of a sub-basement level for new mechanical systems, restroom and other necessities. Bonnie Dimun was date brought in a director in 2007. As she says in her afterward to the book, her mandate was to "Get it Done." In just nine months she did just that, making some tough decisions in order to bring the decades-long project to completion. Since then she and her staff have worked to reinvent the building and the project, including the installation of new "rose" window about the Aron-ha-Kodesh, designed by artist Kiki Smith. The original window was destroyed in the 1930s and after debate, the decision was made not to re-create an approximation (since the original design was not known),but rather to create something entirely new, moving the restoration out of the past and into the present. Since the 1980s the sustaining narrative at Eldridge was about the restoration itself. Now that the most obvious work is done, the presentation has had to shift. Continuing a process begun under Ms. Waterman, Eldridge is now as much about history, family, neighborhood, immigration and cultural life as about architecture and restoration. The new window in the thinking of the project's new leadership bridges the generations. Importantly, in regard to audience, it makes the synagogue both a sacred historic site and a vibrant contemproary art space, too. This new book doesn't dwell on such issues. It is essentially an annotated photo album of the restoration process that makes it hard to forget all the hard work that lies behind the synagogue's present-day pristine appearance - no matter what direction the building and musuem head in future years. These pictures will make hard to forget how dilapidated the building, now so intact, once was. Every restoration project should keep such an album, even they cannot afford in the end to publish. With online construction blogs and You-tube posts it is easy to record the process of restoration. The process itself is part of the purpose. At Eldridge Street and elsewhere the process - especially when it is a long one - allows the opportunity to explore and educate, to advocate and debate and to plan for building use for a long sustainable future. In Gratz's words "Actually, the slow road to success worked in our favor. We had time to do serious historical research about both the building and the people who used it. If we had had all the money early, we might have ruined the building, replaced things that could have been salvaged, refinished others that could have been conserved and in many ways, erased the patina of time. In the mid-1980s the world of historic preservation, restoration, and conservation was not nearly at its current level of sophistication and nuance." 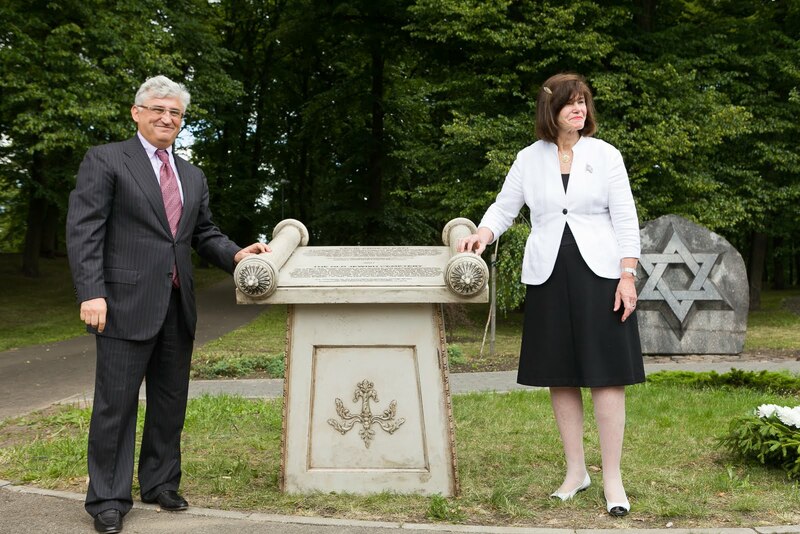 I first visited the restoration at Eldridge in 1989 soon after I began work as the Director of the Jewish Heritage Council of the World Monuments Fund (WMF). Though WMF chose to look abroad for its Jewish heritage projects - especially after 1989 to Eastern Europe, the image and influence of Eldridge were strongly felt. Conservators, activists and historians from Eastern Europe attending WMF's Future of Jewish Monuments conference in New York in November 1990 visited the restoration and came away educated and inspired. Soon after, when WMF undertook the restoration of the great Tempel Synagogue in Krakow, Poland, we looked to the Eldridge experience for method. 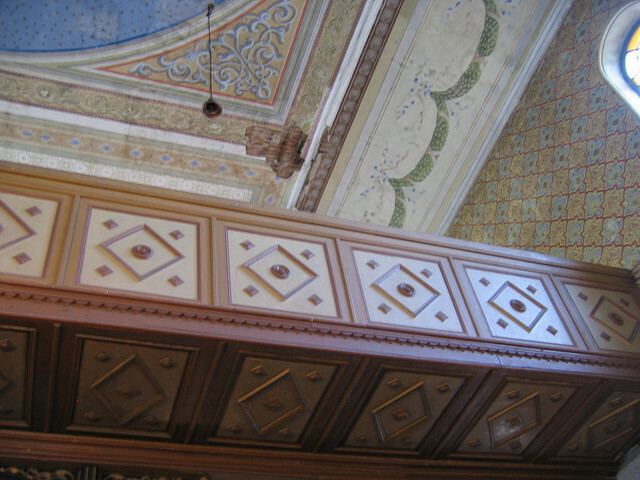 Since then, scores of restoration projects in the U.S. and abroad influenced by the example of Eldridge were completed - ironically long before the actual re-dedication of the Lower East Side synagogue in 2007. Still, they owe a lot to Eldridge as the Jewish monument restoration laboratory par excellance. has hardly been equaled in the annals of historic preservation. To the hundreds of professionals and volunteers who have worked on the Eldridge Street Project and the thousands of financial contributors to the resotration: Congratulations! My sister Ruth Ellen Gruber recently reported on her Jewish Heritage Travel Blog that our ancestral synagogue in Radauti, Romania is under restoration, a process that appears to be proceeding quickly - a rare occurrence in Romania - where the Jewish community is overwhelmed with care for so many sites and is always strapped for funds. I has a special fondness for the Franz Josef Synagogue - as it is known in memory of the Austrian emperor especially beloved by Bukovina Jews. Not only is it the site of my grandfather's bar mitzvah, but it is one of the first "historic" (by which I mean pre-modern) synagogues I ever visited. I was there with my parents on a trip to Romania in 1972. 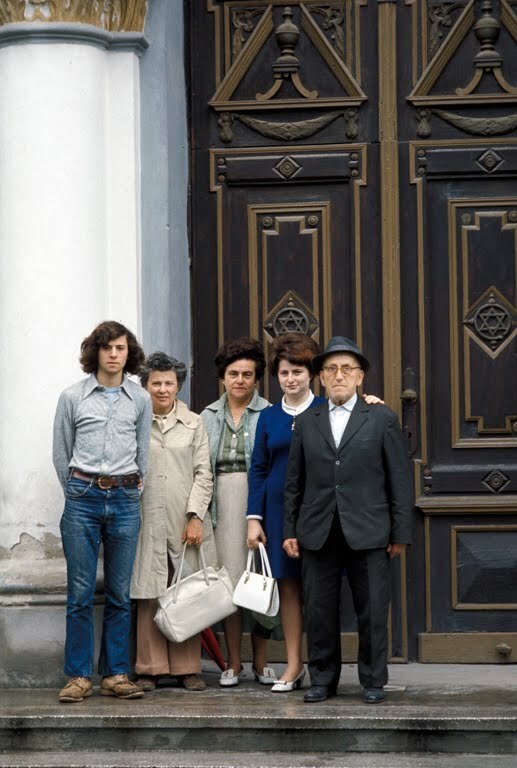 I was a skinny teenager with longish hair, but taller than any remaining Jew we met in the town (see picture). I remember well how one of the men who showed us the synagogue was amazed (real or feigned) over my hair. When told I was a great-grandson of Anschel Gruber, he expressed skepticism (in part because of my hair), and said - "Well, Anshel Gruber was a very pious Jew, if you are his grandson, than read..." and he opened a siddur and stuck it in front of my face. Fortunately, my Junior Congregation and bar mitzvah Hebrew was good enough, and I passed the test. Radauti, Romania. Two views of my visit in 1972. That's me on the bottom left, with my mother Shirley Moskowitz next to me. Note the Moorish-style horseshoe arches on the Ark and Ark wall. Photos: Jacob W. Gruber. 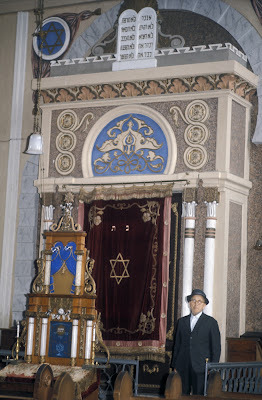 The next time I came to the synagogue was in the bitterly cold winter of 1978, in the company of Ruth, then UPI bureau chief in Belgrade, and Romania's chief Rabbi Moses Rosen (and retinue). Ruth and I accompanied the rabbi on his annual whirlwind Hanukkah pilgrimage to the Jewish communities of Romania. This time the old synagogue was filled with people, brilliantly lit, and filled with song from the children's choir that accompanied Rosen's roadshow. 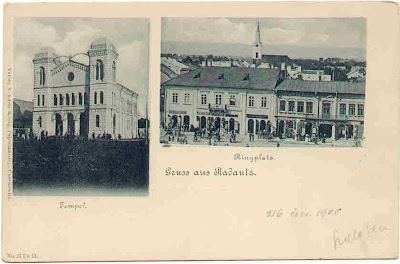 Since then much has changed in Romania - for its diminished Jewish community and for the entire country. But the synagogue still stands and is finally receiving a new lease on life. It is one of the surviving synagogues in the country deemed "operating," and by all accounts it will remain dedicated as a synagogue. 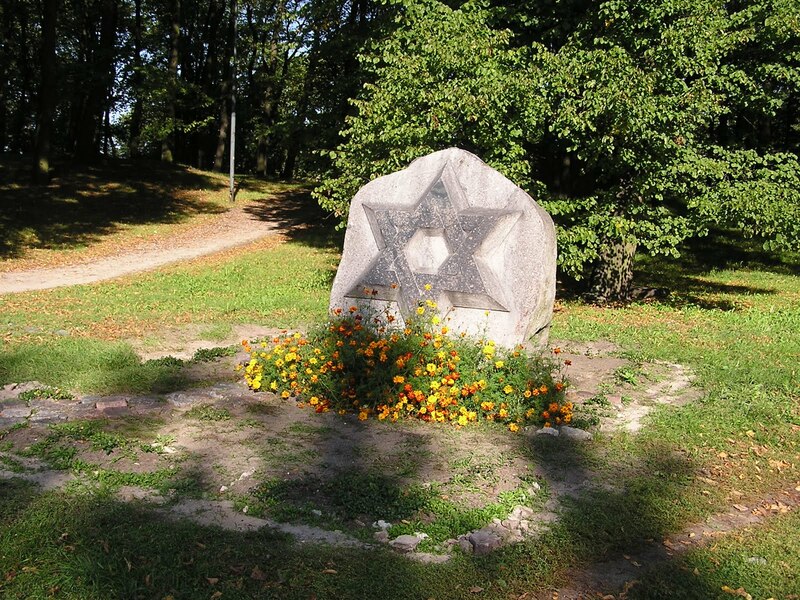 How often and when it will be used is uncertain, for there are few Jews left in the area. Radauti, Romania. Synagogue, interior decoration. 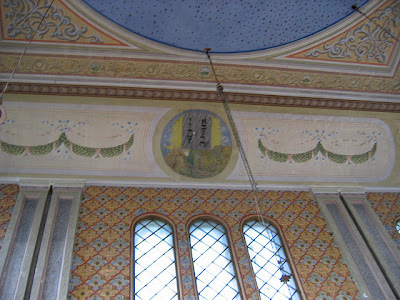 The inclusion of instruments is a common occurrence in synagogues of the region - and elsewhere - illustrating the 150th Psalm. Photos: Arthur Schankler. A few years archaeologists excavated Jewish burials in Tarrega, Spain that showed evidence and violent death, and they put forward the hypothesis that the remains were of victims of a masscre of Jews in that Catalonian town, presumably an event from ca. 1391. Now new archeological evidence from Norwich, England points to the murder of Jews there. Skeletal remains of seventeen individuals found in a well in 2004 has been examined and researched and archaeologists and paleontologists now believe that these were Jewish victims - including many fomr the same family - of brutal murder. According to a report published and broadcast by the BBC, "The most likely explanation is that those down the well were Jewish and were probably murdered or forced to commit suicide, according to scientists who used a combination of DNA analysis, carbon dating and bone chemical studies in their investigation. The skeletons date back to the 12th or 13th Centuries at a time when Jewish people were facing persecution throughout Europe....Seven skeletons were successfully tested and five of them had a DNA sequence suggesting they were likely to be members of a single Jewish family." Eleven of the bodies were of children from the ages of 2 to 15 with five of them below the age of five. Dating of the deaths is not precise, especially since Norwich Jews were persecuted in many periods. They were accused in 1144 of the violent murder of the boy, William (of Norwich), the first recorded instance of the infamous "blood libel." Despite the rejection of the charges, the charge led to persecution and at least one community leader was killed. In 1190, at the time of the Third Crusade, many Jews were massacred in York and Norwich, where survivors purportedly took refuge in the city's castle. Still later persecutions including executions of Jews in Norwich in 1230. Jews were expelled from England in 1290.